I want to add keyless entry to my 940. I've googled around a lot and I'm a bit confused regarding the relation of keyless entry and VolvoGuard. My 1997 940 has stickers on the window saying it has the VolvoGuard 2, but it did not come with a remote when I bought it from the PO. The little alarm light that is usually sitting in the left grille on top of the dash near the A-pillar is also not there, just the blank hole. I suppose PO or someone before him removed the alarm. Does anyone might know what exactly had been removed to deactivate it? - Is my 940 already equipped with keyless system because of VolvoGuard (it had at some point...) and I just need a remote and some relay? - Do I need to start from zero with getting a lock motor and the whole system with receiver etc.? I already found a thread on here to add the keyless system from a 850 to a 7/9 car, but I obviously want to avoid this if there is an easier way. Last edited by sbabbs; 02-27-2019 at 03:35 PM.. Thank you. Not really want to go aftermarket to be honest if there is a way to make this work with Volvo stuff. First check what relay is behind the glovebox. Is there still the guard 2 relay? Guard 2 is mainly the relay and the handset which can easily be linked together. So that means if there still is the guard relay, it should still have the function of keyless working (in theory)? How do I access this, reach behind the glovebox from the below pass kick panel? I don't have access to my car right now, so I can't try. Alright so I've had a closer look today and even though the sticker on the windows say that I have an alarm, one of the PO's must've removed everything, as there is no blinking light on the dash, no alarm horn in the engine bay and the bypass relay behind the glovebox. Could be that the driver door will not unlock because there is no lock motor, but if the car had an alarm at some point it should be there and if it doesn't the motor is available on Skandix. Will get a 210/211 relay and a key fob now and try it out. I also don't have a "standard" simple key for what it's worth, I guess this is the chipped "immobilizer" key. I think this is a further hint that it was equipped with an alarm at some point. Pictures of relay, sticker and key below. Last edited by Fa182; 01-01-2019 at 12:35 PM.. Thanks, the key fobs are still available new from Volvo and a lot of used ones on ebay. I’ve done a full VGA 2.2 install in my 945, and posted a brief article a while back on the later VGA 2 / 2.2 setup. PM me if you need more info. Idiocy is multiplicative. Two half-wits do not equal a full-witted person; they equal a quarter-witted person. Stupidity does not build upon stupidity to create genius. It breeds like a bucket full of coked out hamsters. Great information right there, thanks! I don't want an alarm, just the keyless entry function. I understand 96+ cars are prewired anyway (I have a 97), regardless if they had VGA or not. I do see some empty connectors in the engine bay, which I always wondered what they are there for and now I think they are for the alarm horn and a sensor after looking at your PDF, which makes total sense. I assume by adding the relay and connecting with the right frequency key fob, it enables keyless entry function, correct? I also read that the relay is grey for US and black for EU (because of the different frequencies). What's the green connector on top of the relay or what does it connect to? So you're not looking for a VGA setup, more a Keyless Entry setup similar to what the North American market saw. From your picture, it occurs to me that your '97 has both the immobilizer system and starter cut out relays, but not a full VGA setup given the 210 relay sitting right next to a vacant black 9-pin connector for the 211 relay and the absence of a dash LED. I don't really have a ton of info on Keyless Entry as it typically was only offered on 960/850's (etc); but I have seen Keyless Entry relays in a variety of colours including orange, black, green in scrap 960's/850's. The systems are identical between models except wiring colour code. I'm not certain which Keyless Entry relay pairs up with the 2 or 3 versions of the remotes offered as again, I was more focused on a VGA installation. Here is what the top of a VGA 2.2 looks like. 960/850 Keyless Entry/Central Locking relays look similar but without the green 5-pin connector on top. Note the extra 2-pin connector which connects to the existing door lock wiring. Sorry for a lousy picture. Using the wiring logic of the VGA connectors as detailed in the .pdf, it would likely be easier for you to install an aftermarket keyless entry system than piece an OE Keyless Entry system together - besides, most of the OE components will have 20+ years of use and likely be kind of flakey. I'm also unsure if the OE Keyless Entry relay logic is similar to or identical to the VGA relay logic, so it may not be a simple plug/play install regardless. You'd need to reference a 960 Keyless Entry/Central Locking system wiring diagram and compare to your 940's prewiring to be certain. Last edited by DEK2688; 01-03-2019 at 01:15 PM..
First of all, thank you so much, that is very helpful. Yes, I just want the keyless entry function, don't need an alarm. I want to use Volvo stuff as much as possible, not any aftermarket, especially if there is already existing wiring in the car. The comments about the lock motor are contradictory if the later EU 940 cars already had them installed or not, but most of them say that everything is prewired for VGA on 96+ models, so maybe the right lock motor is there as well. I just need to find some time to dismount the door cards and check. I'm really thinking that the car already had VGA at some point and someone just removed it, just by looking at the window stickers, key and empty hole in the dash speaker cover. Anyway, I already found a used relay and matching key fob from someone, so I will go on to my next steps next week after I receive them. Was your car originally sold in the German/Austrian market? 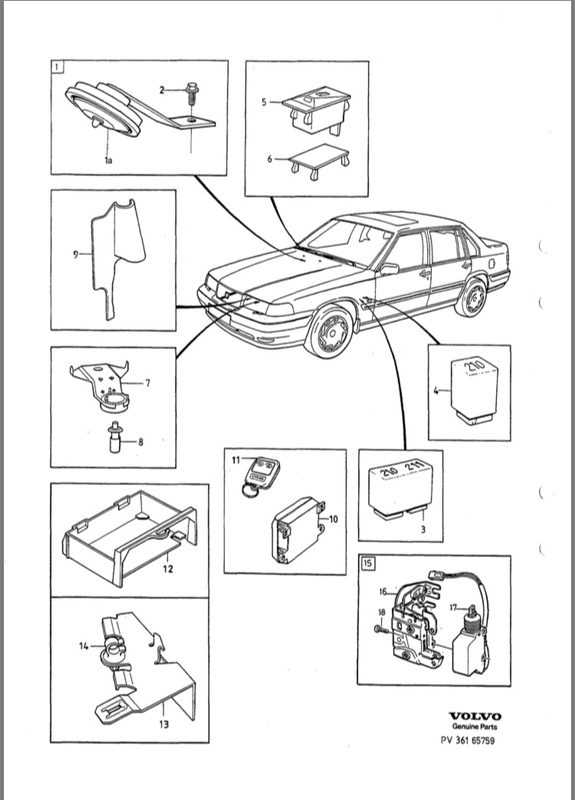 Immobilizers became mandatory in parts of the EU in '96, and your system may have been Volvo's attempt to satisfy both ECU immobilization and starter cut requirements without installing a full VGA system. If you had a full VGA system previously installed, you would also have the sensor/LED wiring harness, a front glass sensor, an underhood switch (at the drivers hood latch), an alarm horn (near to the overflow tank/air cleaner) and perhaps a tilt sensor depending on what your VIN is - in addition to the dash LED. Is there a blanking plug in the dash speaker or an actual square opening through the dash speaker? It may have been that the blanking plug was pried out if it is missing. It'd be far more work to remove the LED than to simply unplug it. Last edited by DEK2688; 01-03-2019 at 02:40 PM..
You continue to amaze me with your knowledge about this. My car was sold in Germany in 97 and I imported it to Austria 2 years ago (decent Turbos are like finding hen's teeth around here in Austria...). Can't tell if there were those sensors installed at some point, I do not see any of them however. My thinking is that if they removed the VGA, they might have removed every sensor along with it, and maybe they left the motor in, but who knows. I guess the only way to tell if I have the motor installed is to actually have a look. If there is no motor, I guess I'm off looking for one. As it is NLA, it might be hard to come across one. There is no blanking plug in the grille, just the bare opening. If you don't have a hood switch installed or the green connector sensor/LED harness, its likely the car never had a true VGA system. I'd hedge a bet that the car was delivered with only the immobilizer (which kills the fuel pump signal from the ECU when activated), and starter interrupt relay (which is likely controlled by the immobilizer in this installation). I'll have a look at the wiring diagrams I have for the immobilizer installations tonight and see if that is the case. If so, your system may be factory-installed as such. I tend to think that no right minded person would spend any time removing sensors from a dead VGA system that they were just going to partially piece back together to be 1/2 functional by installing a starter interrupt relay and wiring it through the immobilizer circuit. Too convoluted to do. I have a few extra door motors if you have no luck finding one in your door and can't source one from Europe. Thanks for your help! Really appreciate it. I just talked to the guy I'm getting the relay and key fob from and turns out he also has some spare motors from his donor V90's. Thanks for your offer though! So do you think my plan by adding just the relay + motor in the driver door will enable keyless entry, or do I need any more components? Last edited by Fa182; 01-03-2019 at 05:59 PM.. Unfortunately, the V90 lock motor is quite different to the 940. The 940 is the first pic, S/V90 is the second. They arent interchangable. The 95- 960/S-V90 central locking system is also very different to the 940’s, the ‘95- 960’s system is more like the 850’s. You’d have to reference the wiring diagrams to determine if the 960 210/211 relay and 940 210/211 relays are interchangable. Here is the 9-series parts diagram for keyless entry with no alarm/basic alarm. You’ll need the control unit - number 10 on the list - to talk to the VGA relay and vice-versa for the car to unlock and de-immobilize. Providing that the wiring logic is compatible between the 940 and 960 for relay 210/211, then theoretically the system should function. Last edited by DEK2688; 02-26-2019 at 04:56 PM..
Oh boy, this is getting complicated. When I look up the motor 9127570 on Skandix with my model correctly put in the site, it says it fits my 940 and S/V90's from 1996 onwards. When I change the model year to 1995, it says it doesn't fit. From what I understood and what the guy I'm getting the parts from told me, 1996+ 940 and 1996+ S/V90 models use the same system and motor. Maybe they just adapted the later 96-98 EU 940's to use the parts of the 960 & S/V90 or 850 to cut down the number of different parts for the same system. That would make sense to me, as I found that the late 850 models uses the same relay than the late 940 models. 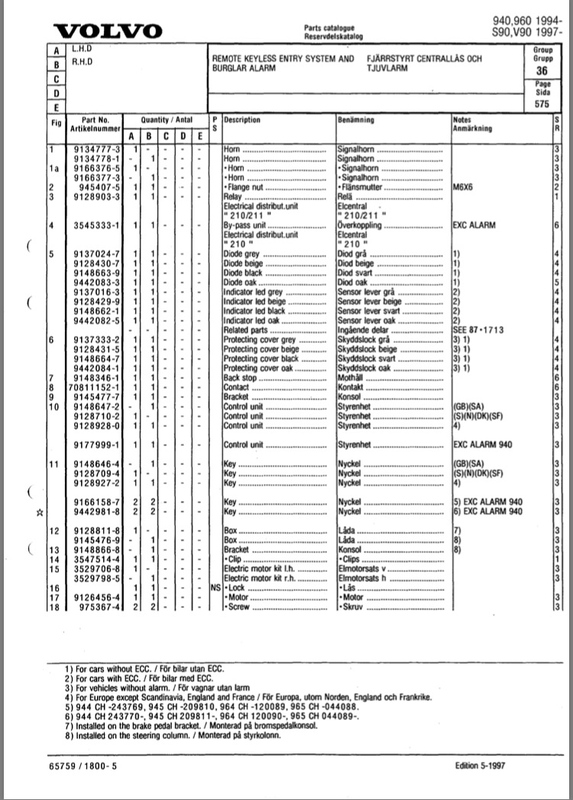 My reference is the last factory 900-series parts guide for UK/Sweden PV-010-68626, Edition 05-1997 with updates to 2001. I tend to not trust word of mouth nor internet parts references as they are at best subjective. In no way does the factory parts guide illustrate that the 940 locking system ever went to the 960-style, even into the '98 model year. I'm happy to email you the .pdf's that clearly outline the locking systems between the 940/960-S/V90's. Additionally, the door wiring harness did not update for the 940 after '95; while the part number changed in '96 and '97, it shows that the '97 harness is compatible with and will work on a '95. 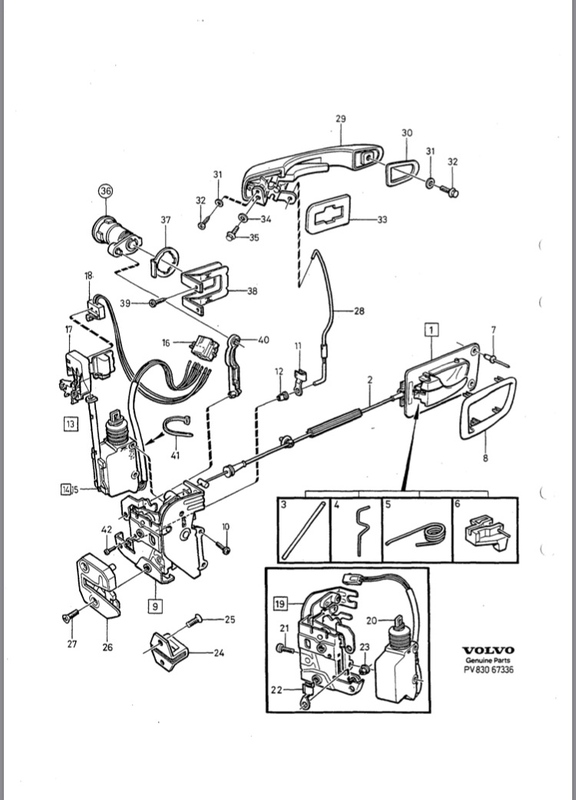 The 960-S/V90's show an entirely different harness part number and assembly, starting in '95-. Lastly, the VGA installation kit for the 940 was always a 9124750, which contained the 940-style locking motor. However, there are anomalies in the realm of Volvo, so the only true way of verifying which lock motor you'll need is to pop off the door panel and have a look. My money is on the 940-series. As for the remote locking relay, you are correct that the relays would be shared between 8/9 series in later production. Its likely that the part numbers have updated in the 17-odd years since the factory parts guide I'm using was published given the fact that the relay was used after 940 production discontinued. 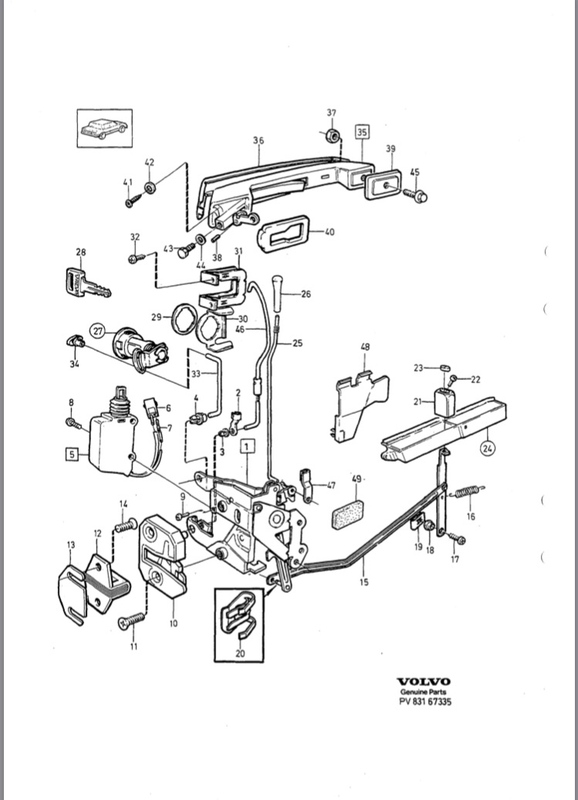 Easy to verify thru a Volvo parts dealer - I can check if you'd like. That interchangeability applies for the VGA stuff too, where the 9166157 VGA2.2 was shared with S/V70's. That being said, I'd presume that the 210/211 relay wiring and terminal logic would be the same between 940/90/850, but without verifying via wiring diagrams and testing, presumption can result in some catastrophic and undesirable outcomes. Last edited by DEK2688; 02-27-2019 at 12:55 PM.. Thank you very much once again for all the detailed information. The guy also said I can send him the parts back without a problem if they don't work, which is very nice of him. With the big help of Rich / DEK2688, I got the remote entry working now. It is very nice to have and reminds me of how much I missed this feature from my previous cars, especially when my hands are full carrying stuff and I do not need to go around to the drivers door to unlock the back doors now or put the key into the tailgate lock. 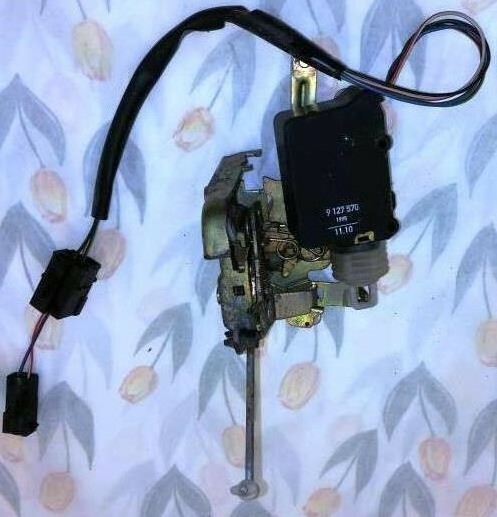 - Get a drivers door lock motor with the 2 separate connectors for 940 (9127570 - NLA - got a used one from Sweden thanks to a hint from Rich). The one from the S/V90 will not work as it is a different locking system. My car (1997 940) was prewired with everything so it was just a matter of plug and play and finding the taped up connectors in the depths of the dash, but very easy in the end. What did not work initially was the used key fobs I got, but now I have the brand new one it worked the first time after I programmed it. Last edited by Fa182; 02-26-2019 at 04:22 PM..